And here’s the monthly manga review for August. I’ll add D.Gray-man and Kimi ni Todoke once the chapters are released. This review will also have chapter reviews for Gate 7 16 &17. No you didn’t misread the title, this is just an extra chapter focusing on Renzo and Izumo’s pseudo-date. Even being quite short made this chapter a bit of a nuisance because I was hoping to see how the story is going to progress after it took 4 chapters off from the original plot. The chapter doesn’t do anything new except for give Renzo and the very tsundere Izumo a chance to get closer, a plot point I don’t really care for. I guess the comedy was ok, what with Renzo’s brother screwing his brother out of a proper date just to get more of an audience at his concert. It also became funnier when the whole gang showed, each with their own naive and care-free attitude, making the situation more uncomfortable for the chapter’s protagonist. 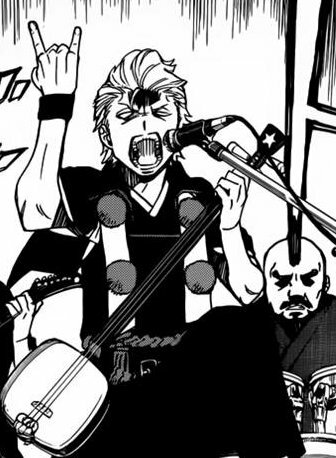 So now that the in between arc filler chapter are over, I’m expecting to see Ao no Exorcist back in the Jump SQ October Issue with a brand new arc. Amidst all of the fighting and after all of that build-up, Claymore has a more sentimental chapter. What a chapter it was! I can’t honestly say I remember the last time we saw Clare. Since it’s been so long, it is good to have her back in the story and what better way to bring her back than with Raki. Their long time separation only made the moment that much better and Clare’s absence from many of the recent chapters made the reunion feel like it had happened after a much longer time. The reunion was definitely the main focus of the chapter but at the beginning when we see the Claymores in their suits of armour, it makes me think that the build-up still continuing. This build-up follows on from the previous chapter and even though the majority of this chapter was about something else, it was still present. A very good chapter from Claymore that took the time to progress the plot but also hold back at the same time. In an attempt to change things up, Maid-sama! decides to explore Takumi’s royal roots. There is kind of set pattern in this series when it comes to balancing the romance part of the plot and the other part, so this chapter comes at an expected point. Takumi’s character has always been somewhat of a mystery and even when we find out something about him, it isn’t much. This is one of the rarer opportunities to find out more about the roots of his character but it seems like he’s adamant in keeping all of this behind closed doors by distancing himself completely from his family. A part of me thinks this arc will be resolved in a few chapters and then Takumi will run back to Japan to be together with Misaki and I’m okay with that. Quite frankly, his background doesn’t interest me much and I never find any satisfaction in reading about characters with royal British heritage in manga. Gerard has a bigger role than his previous cameos in this chapter and he could potentially bring up his illness at any time in an attempt to guilt Takumi into staying with the family. That seems like the most obvious plot direction Maid-sama! could take, which will inevitably lead to the pinnacle of all turning points in shoujo romance manga; the Prince has to choose either the girl or his duty. It’s not hard to believe that yet again I am most impressed with Shingeki no Kyojin. 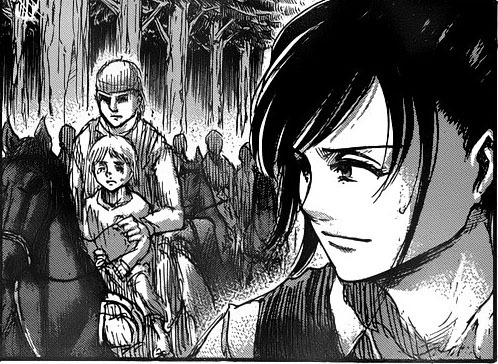 Sasha was the focus of this chapter…….I’m sure many would be thinking that was a stupid move on the author’s part but I was really happy to learn about her background; she doesn’t tend to be a character who we know a lot about and most of the time she’s nothing more than the other characters’ whipping girl. As clich as it might be to have a character who gets picked on a lot be forced into a position requiring bravery, I liked it and probably more-so since it was in fact Sasha who was forced into the situation. Now the impressive part of the chapter is that another highly relevant and often forsaken point about survival was brought up: adaptation. Whenever someone says that word I immediately think about evolutionary adaptation and I may not be the only one, so I’m glad that it was brought up in this context. Human beings nowadays adapt to societies and change their ways to fit in and fend for themselves, the very basics of evolution and at the stage we’re at now it’s the more common adaptation. “The minority changes to fit in with the majority” is such an accurate way to describe what happens to a lot of people who so much as move territory, even in the real world. By touching on another important and relevant plot point in this chapter, the series has escalated into another level of greatness that is currently unmatched by any ongoing shonen series of the same genre. 16.It took about 15 chapters but Chikahito finally has some use. It might have taken a while but with everything going on in the world of Gate 7, it’s understandable that Chikahito has been somewhat of a bystander for all of this time. It definitely didn’t help that a large chunk of the cast was introduced not too long after the setting was explained in the first few chapters. Iemutsu continues to leave a bad taste in my mouth. He’s a little generic in some sense, being the innocent looking bishonen who’s datk twisted inside but that only adds to my distaste of his character as a whole. His appearance isn’t much in this chapter, just enough to confirm that he is a twisted individual seeking pain and destruction. The ending is, well, boring. It’s Gate 7’s style to constantly end with the background going pitch-black and enemies popping up and it’s getting old quickly although this time it didn’t happen to the protagonists but insted to Sanada & Co.
17. With chapters like this it’s no wonder many don’t read this series. This chapter will probably seem like the most pointless use of 20 odd pages to someone who has no idea about the Japanese history which is used as a basis for the entire plot of the manga. I’m one of those people. You can chalk this up to the “lost in translation” category where many chapters of Gate 7 reside. If you do understand the relevant Japanese history, I’m pretty sure you would understand the significance of Sanda’s choice far better than I did but to me this chapter accomplished squat. Not understanding the history may be one thing, but I’m confident enough to say that the stage is now set for more rapid developments to take place. I have liked Gate 7 for taking it easy thus far but kicking up the speed in the plot progression has been long overdue, so I’m more excited to see the story move at a faster pace than before. Final Note: If your having trouble remembering all of the characters from Gate 7, refer to this list. It lets you put a name to a face. 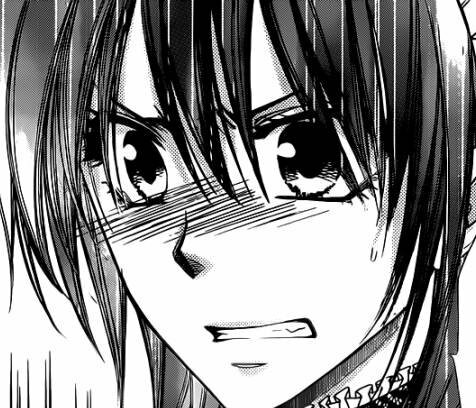 Now that Kent and Ayane have gotten together, I’m happy to see Kazehaya and Sawako’s relationship being revisited. The tension has been built up for quite some time now, and because of how little content the previous few chapters had covered it feels like it’s been a long time since Kazehaya and Sawako have been happy. I don’t really understand Kazehaya’s fear of not being able to hold back but that’s because much like most men, I’m not a stereotypical “prince” you find in shojo manga. The outburst of emotion was definitely one of the best I’ve seen in the whole series. Sawako never speaks up, which is part of her character but at the same time it causes frustration. Even when you have quite main characters you want to see them develop and do something that they haven’t done, and with this chapter Sawako has seriously stepped up and become a more likeable character (didn’t think it was possible, did you ). Sawako wasn’t the only one. Kazehaya took a big step as well by finally “manning up” and doing right by his girlfriend. Not holding back, the kiss these two shared would have had many readers screaming “FINALLY!” and I thought that it would include me but instead I relished the purity of the moment and forgot that it took this couple 71 chapters and a few failed attempts to finally share a kiss. For the next Monthly Manga Review I’m thinking about adding JoJolion (JoJo’s Bizarre Adventure Part 8) and Big Order to the line-up. There may be a few others making the cut, or I might decide on other titles than the two I mentioned. Either way, more manga will be reviewed! I remember that Clare first disappeared right after the point where I got caught up with the series, so this was a great moment for me because it reminded me of everything that happened before then. It'll be great to see her back in action after so long. Definitely want to see her back in action, it's been too long.